Hello there, my fellow weekend warriors! As you go through the daily grind Monday through Thursday, there’s one shining light at the end of the corporate tunnel pulling you forward through the afternoon coffee runs, overflowing emails, and mini chocolate bars fully stocked in the office kitchen that you just can’t resist. That shining light, my friends, is our Social Media Snap (you thought I was going to say the weekend, didn’t you?). 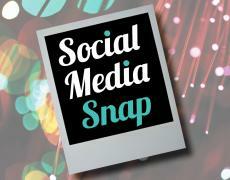 So sit back, relax, and enjoy this week’s highlights of all things social media. Here’s one we haven’t heard from in a while. This week Linkedin saw some backlash after they removed one company’s ads featuring female web developers. According to several user complaints, the ads were not “realistic” and the company, which connects web engineers and designers with employers, was not advertising its actual services (because obviously women could never be engineers. Oh wait, this isn’t 1913?). Luckily LinkedIn recognized their error and replaced the ads, but not without raising a few eyebrows about the perception of women in techie, male-dominated industries. If it weren’t for Facebook I would NEVER know anyone’s birthdays. Many people rely on Facebook not only to notify them of a friend’s birthday, but also to help relay their sentiments through an obligatory “HAPPY BRIRTHDAY!!!! XOXO LOVE YOU ” wall post. This week Buzzfeed introduced a new Facebook app that allows you to see who did, and didn’t, wish you a happy birthday. Let’s just say my Friends list is about to get a whole lot shorter. Lately, a number of people have taken to social media to publicly shame those who have wronged them. While sometimes this can be beneficial, such was the case in catching a serial dine-and-dasher, other times can stir up even more trouble. One café owner in Washington received some serious backlash after posting a “shaming” photo on Facebook of a messy table left by two moms and their kids. While some are standing by her, saying parents should clean up after their kids and that it’s not fair to leave disastrous tables for the employees, others have said she was overreacting and have even threatened her. The highlight of super bowl ads this past February was not your typical TV commercial, but rather a quick Tweet from Oreo about the power outage. Apparently the judges of the Cannes Lions awards agreed as Oreo’s “Dunk In The Dark” ad went home with quite a few shiny trophies. One ad man, Andrew Teman, was less than thrilled is claiming that he’s quitting the business. I think that’s a bit of an overreaction to one little Tweet, but hey, at least he’s got principles. “Rich Kids of Instagram” a popular Tumblr account that’s pretty self-explanatory, has inspired a new reality show on E! featuring “several of the blog’s 20-something friends who are ‘living in a world of extreme wealth.’” I guess the Kardashians just weren’t enough. For years people thought social media was just for the youngsters and teeny boppers, but this is no longer the case. A study came out this week reporting that social media use among people over 50 is growing faster than any other age group. And experts say this number will continue to rise as more people 50+ learn how social media platforms can benefit them. This week, Twitter announced that it would start cracking down on abusive Tweets. “The site announced a list of changes this weekend in response to complaints that it wasn’t doing enough to combat hate speech, particularly against women.” While social media can be a great tool for communication, it’s unfortunate when a handful of people use it to scare, humiliate and degrade others. A new study came out yesterday on the power of a “Like”. According to the study, “If you ‘like’ [an] article on a site like Facebook, somebody who reads it is more likely to approve of it, even if the reporting and writing are not all that great. But surprisingly, an unfair negative reaction will not spur others to dislike the article. Instead, a thumbs-down view will soon be counteracted by thumbs up from other readers.” These findings will present a number of implications for review sites like Yelp and Amazon as well as companies looking to generate word-of-mouth buzz. Facebook changed its news feed! Again! Facebook announced that “Now, instead of seeing the latest photos, links and status updates, you’ll see a mix of the latest posts as well as older — but relevant — posts you missed the last time you checked Facebook.” Hopefully we can avoid the “OMG this is sooooo stupid. I miss the old news feed! Sign my petition to get the old news feed back!” posts that typically come with any Facebook change.